Homemade Chocolate Croissants made from scratch, a well-deserved morning treat to help us get through the day. So soft, flavourful and baked to perfection. It can’t get any better than that, trust me! I have never been a morning person, and l used to hate mornings with a passion. I still do, except that now l’m a mummy and waking up (way too) early has become part of my daily routine. Obviously, my little ones don’t care that 5am is not a decent time to start the day, their beauty sleep is over and there’s no more talking on this subject! If l’m lucky enough, l get to make myself a cup of tea. And sometimes l even get to drink it. I know, how good is that? Give me a chocolate croissant next to my cup of tea and you’ve made my day. Oh, heavens! That’s what l call a treat! 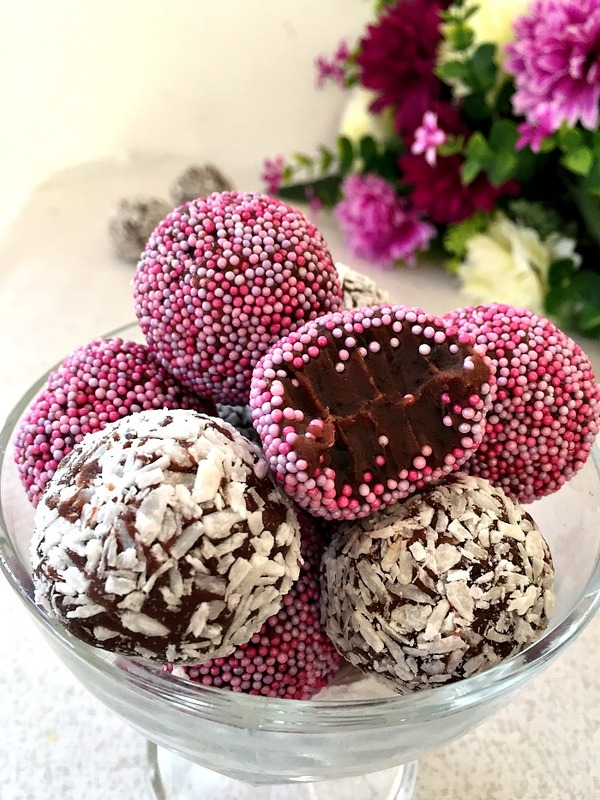 Now, it might not be the healtiest breakfast to have, especially if you are looking after your waistline, but one small treat now and then can’t do any harm. If anything, it will make you even more determined to go back to your healthier eating, isn’t it? 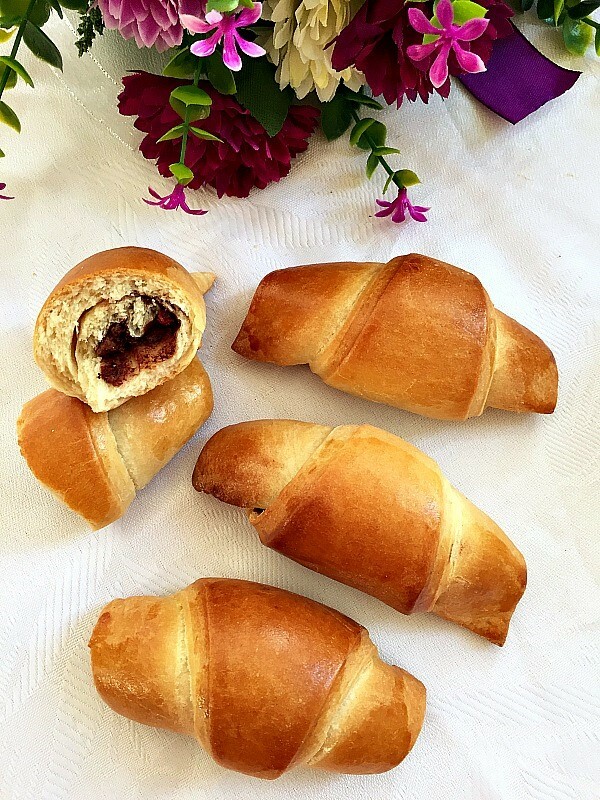 Do you you make homemade chocolate croissants without puff pastry? Honestly, these are the best croissants l’ve ever had. You really have to smell the delicate aroma that fills the kitchen when they are baking in the oven. And making them is super simple. Using puff pastry may be quicker, but this homemade dough is the best you can get. 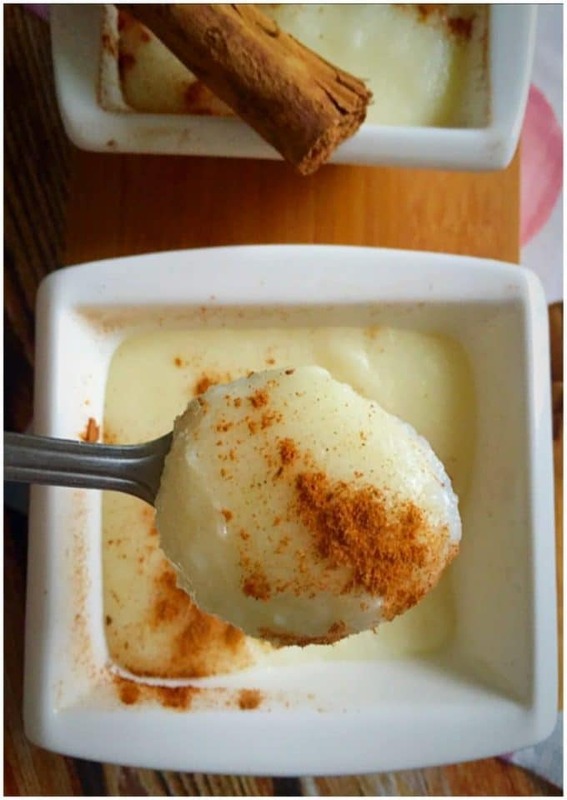 in a bowl, add the warm milk, fast-action yeast, a a bit of sugar and flour, and set aside for 10 minutes. This is to test whether the yeast is still active. It should become foamy and rise, if it does not, if means the yeast is no longer active and can’t be used anymore. If you do, the dough won’t double its volume, and the croissants won’t be fluffy, but tough and rubbery. Add the flour, yeast mixture, sugar, oil, and a pinch of salt, and knead well for at least 5 minutes until the dough becomes elastic and it does not stick to the hands. Cover the bowl with clingfilm, and leave to prove in a warm place for at least 1-2 hours. 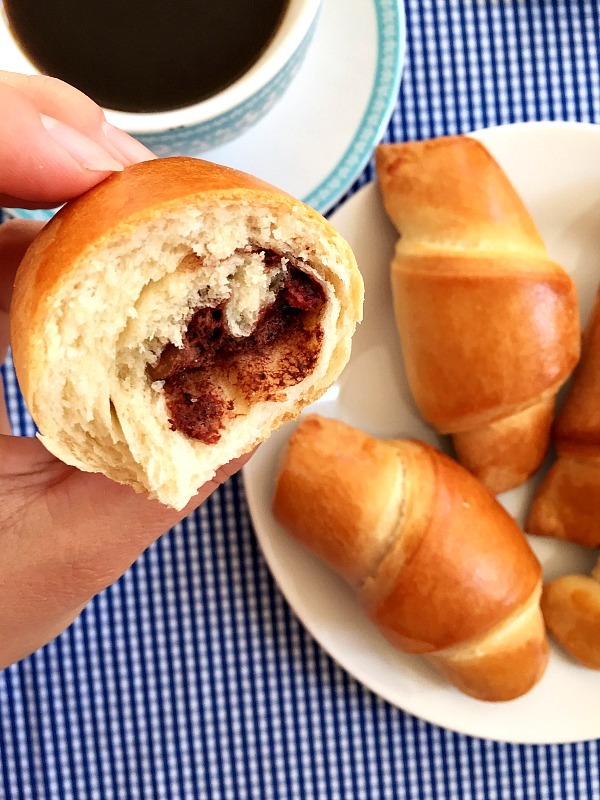 How do you make chocolate filling for croissants? Of course, the filling is entirely your choice, and you can go for something else, either sweet or savoury. They are even better than the croissants you would buy from a posh French bakery. Nutella would be another choice, or even melted chocolate. Cocoa works nicely here, I think it’s a bit less messy that other fillings. And if I can avoid mess in the kitchen, I definitely go for it. Beat the egg white until it holds soft peaks. Beat in the sugar until you get a meringue-like consistency. Add the cocoa powder, vanilla extract and beat well. If you chose to use walnuts and dried cranberries, they can be added now. Up to you though, it’s optional. The whole family will enjoy these croissants, and they also make a great choice as a snack in your little one’s lunch box. I personally don’t mind having some for breakfast, lunch, dinner or between meals. They are that good. And really there is no need for a ready-made pastry, you can do it at home. It may not be flaky, it’s fluffy, soft and very yummy. Looking for ore fancy breakfast ideas? I’ve got you covered. I’ve got waffles, pancakes, crepes and many more. 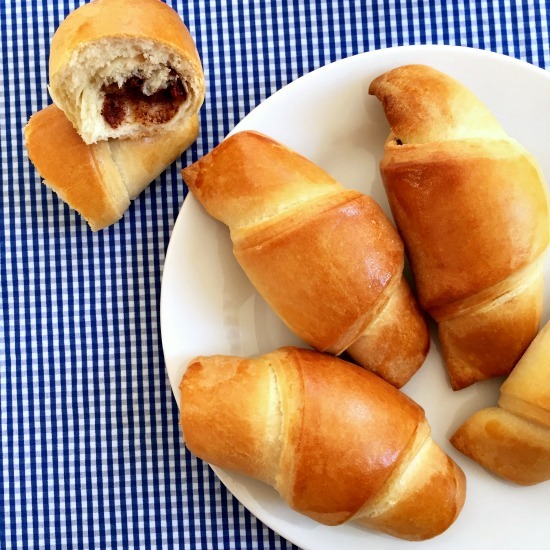 If you’ve tried these CHOCOLATE CROISSANTS or any other recipe on the blog then don’t forget to rate the recipe and let me know how you got on in the comments below, I love hearing from you! You can also FOLLOW ME on FACEBOOK, and PINTEREST to see more delicious food and what I’m getting up to. 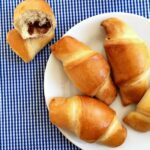 French Chocolate Croissants Recipe, a delicious morning treat that goes so well with a nice cup of tea or coffee. 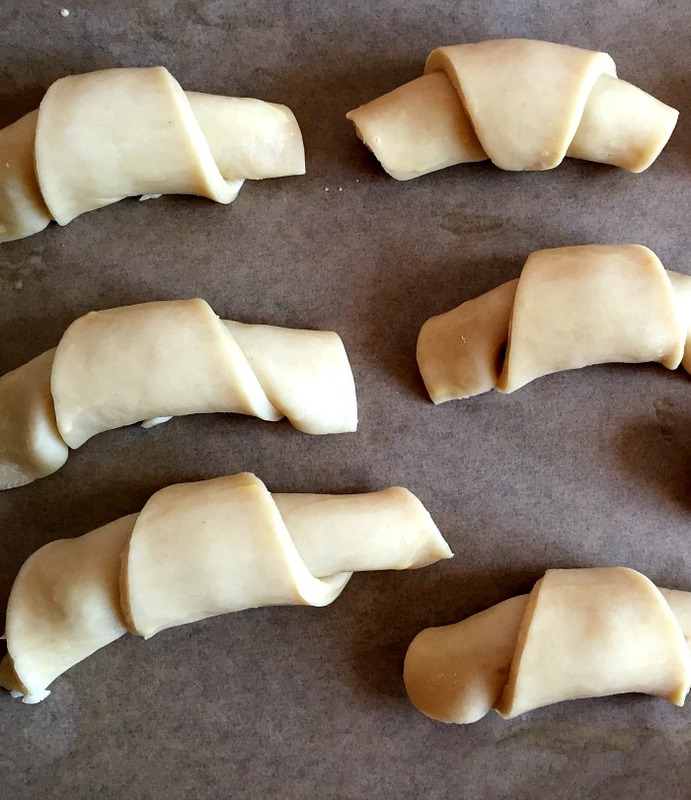 Little ones will love these yummy croissants, and big ones too. To make the dough, warm up the milk (not hot), add the yeast, a teaspoon of sugar and a teaspoon of flour, and set aside for 10 minutes, the yeast should become foamy. Sift the rest of the flour in a large bowl, add the remaining sugar, a pinch of salt, oil and the milk mixture. Knead well for at least 5 minutes, the dough should be elastic and not stick to the hands at all. Shape it into a ball, cover with clingfilm and leave to prove for 1-1,5 hours in a warm place. To make the filling, use a hand mixer to beat the egg white until it forms soft peaks. Add the sugar and beat again until it has a shiny, meringue-like consistency. Beat in the cocoa powder, vanilla extract, then use a spatula to incorporate the walnuts and cranberries. Once the dough has proven, transfer it to the work surface and roll it into a large circle. Cut it first in half, then quarters, then half the quarters too, so you end up with 8 pizza-like slices. Place a teaspoon of the filling at the round end, then roll it up to get the crescent shape. Slightly beat the egg yolk with milk and brush the crescents. Line a large baking tray with non-stick paper, arrange the crescents on it, then bake for about 20 minutes until golden. If you'd like to see the ingredients listed in cups and ounces, click on the US Customary link. Now THESE look good! I’d love to see the surprised looks on the faces of my family who bite in expecting just another crescent roll! 😉 These are sure to be a hit! These look too good to eat, Daniela, and totally decadent. 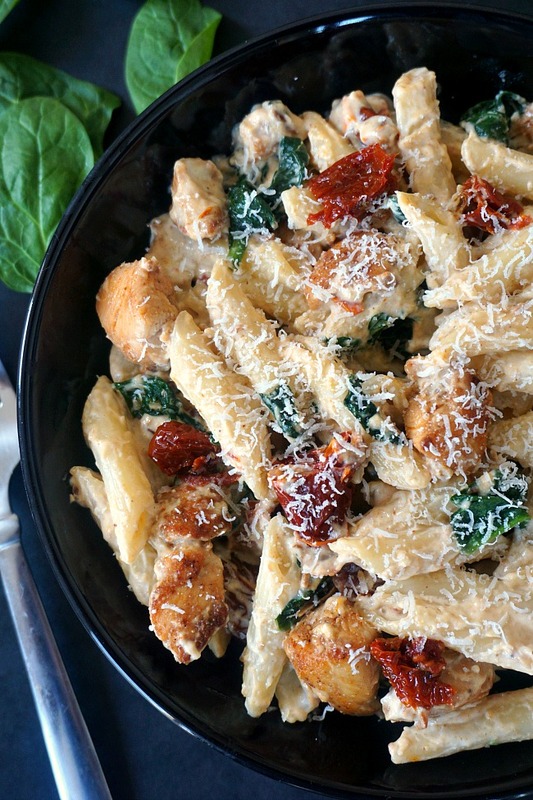 I must have a go at making this recipe. They are lovely, Millie. Do give them a try, l’ve made them a few times and l loved them.